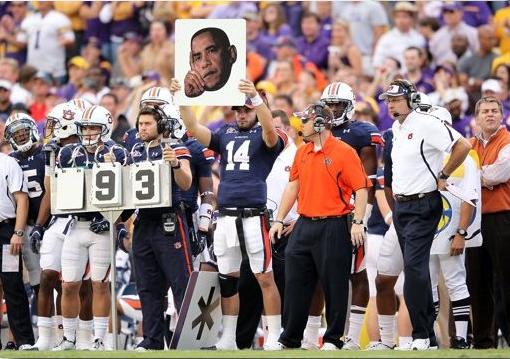 Auburn’s cuddly, Google search relationship with President Obama has gotten even more serious. 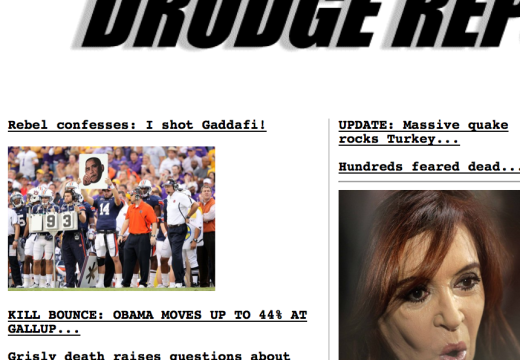 When the Drudge Report needed a graphic to go with a link to a Sunday afternoon story on the Gaddafi “Kill Bounce” bump in Obama’s approval rating, it went with a picture of Barrett Trotter holding aloft a photo of POTUS on the sideline during Saturday’s game against LSU. Of course, if memory serves, the Obama play wasn’t what one might call effective, but thumbnails are known for their sense of irony. In February, the Drudge Report used a photo of Cam Newton and Kodi Burns taken during Auburn’s visit to the White House to link a story on Auburn’s favorite rapper Lupe Fiasco calling Obama the ‘biggest terrorist’ in America. Related: The Auburn White House visit photo you didn’t see. The Obama play – no real plan, just HOPE. I came here to post this to you and it already was. TWER Delivers. I saw that picture when I was watching the game! I was wondering what it meant. I guess it meant do something stupid and run far left. Mark at TheAuburner pointed out the fantastic joke that there’s an asterisk play card on the ground next to him. Now THAT’S funny.